It has never been more important to learn how to locate relevant, credible sources, to evaluate competing ideas and arguments, and to share our thoughts with others in a compelling, well-supported manner. This edition of The Bedford Researcher, like those that have come before it, was written to help students strengthen their ability to understand, assess, and contribute to ongoing conversations about important issues. Tech-savvy and student-friendly, The Bedford Researcher addresses the wide variety of source-based writing students do and the kinds of sources they actually use, from multimodal projects and oral presentations to Web sites and digital databases. 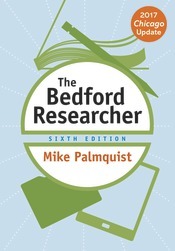 The Bedford Researcher strips away the complexities of research writing across the disciplines and offers the practical help students need to write with confidence while integrating electronic sources and tools into each stage of the process. It addresses the vast amount of information available to writers, the expanding variety of media and genres used by writers to share their work, the critical importance and increasingly challenge of evaluating sources, and the demands of managing information effectively and efficiently. Now available with LaunchPad Solo for Research and Reference, which includes a mix of tutorials, practice exercises, and student writing to help you get the most out of The Bedford Researcher.